Comfortable family holiday home for everyone including your pets!! Welcome to Razamataz, a great and very comfortable family home that gives you everything that you could need to make your next holiday relaxing. Wood heater (wood supplied) to keep you warm and cosy during the colder months and new split heating/cooling system for the Summer! With the Lakes not more than an easy 5 minute stroll away, bringing with it a safe beach for children to swim and explore. The beautiful Mitchell River is also only 5 minutes walk with fantastic walking/bike riding tracks and fishing. Your boating needs are met with boat ramps easily accessible at Eagle Point or go straight into the Mitchell River and fish directly off the river bank or anglers pods. There is every opportunity to get outside, so bring your bikes, canoes, boats & fishing rods!! Photo opportunities abound too, so a camera is a must to capture your memories! Razamataz has excellent household facilities with a great undercover outdoor area including outdoor setting and BBQ for informal relaxed dining and entertaining! Three bedrooms, two with queen size beds (main bedroom has an ensuite) and the third with two king size singles. Ensuring everyone is comfortable. Tea - coffee - sugar is part of the pantry - ready for your use! There is an open pantry policy, please advise if we are short on any particular product or any breakages so they can be replaced easily. I am now semi retired and living in wonderful East Gippsland on the Gippsland Lakes. Having been born in the area and after much travelling I have returned to live in the area. Having the Lakes and mountains on your doorstep has always encouraged everyone in our family to boat, fish or get out in the fresh air!! 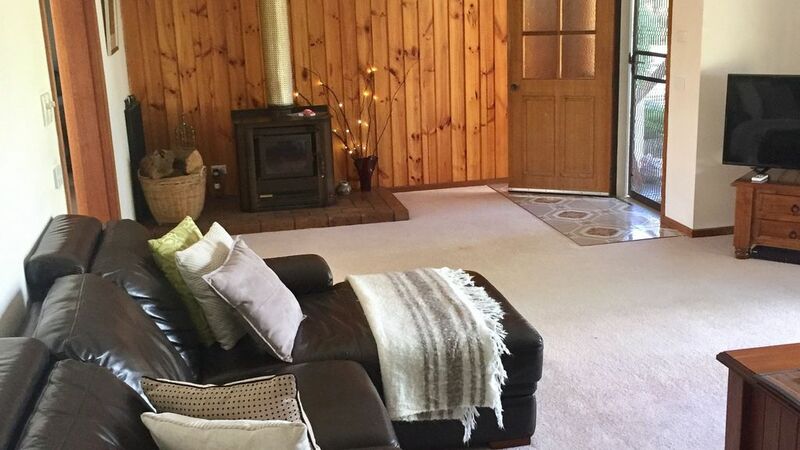 The area is very peaceful and a relaxing to enjoy everything that the Gippsland Lakes has to offer. Lake King is situated at the bottom of School Road, 400 meters from, house!! Fabulous pet friendly accommodation. Was perfect. Great backyard for our pooch. The house was spotless and had everything we needed. Comfortable beds and the location was AAA! Host messaged us and made us feel welcome. Loved having a fire already burning on arrival. Bacon and egg breakfast was brilliant. Everything needed for a ‘home away from home’. Not too far to bike ride to The river or lake, and a decent ride into Paynesville. Large backyard, and beautiful fresh breakfast supplies. Lynda was a great host, easy to contact, and very enthusiastic over the phone. Thanks Lynda, looking forward to our next stay! Excellent place to stay at Eagle Point! A wonderful stay at Razamataz. Very roomy, comfortable, clean and well presented house. Great secure backyard with plenty of room. Lynda was a fabulous host, making sure that we had everything we need for our stay. Thanks Lynda. We will be staying again when we are visiting Paynesville again. Very comfortable, clean and tidy. Pet friendly. This is our se cond visit to Razamtaz. Lynda is a wonderful host, helpful in every way. Loved the Beakfast idea. Much appreciated! It is reassuring to know the garden is safe for pets and that they are allowed in the house, with the usual restrictions of course. The property in well placed for walking, fishing and water sports. We would recommend to anyone and will hopefully be back another year.